With all of the 21st century electronic athletic innovations (the interval timer, the personal navigation system and the step counter, to name but a few), the sports watch seems almost quaint. However, if you have the sort of lifestyle that leads you to spontaneous games of tennis, basketball or runs in the park, then Invicta’s Akula Reserve Sport Chronograph Black Rubber Quartz just might be the everyday watch for you. This sporty chronograph has a durable brushed stainless steel case and rubber watch strap that will stand up to all of your basic athletic exertions. The dial is black with luminous hands for easy legibility at night, and the chronograph sub-dials have 60-second, 30-minute and 1/10 of a second functions. The dial has a submarine instrument panel look to it, which weirdly makes the watch seem rather futuristic, albeit without digital amenities. 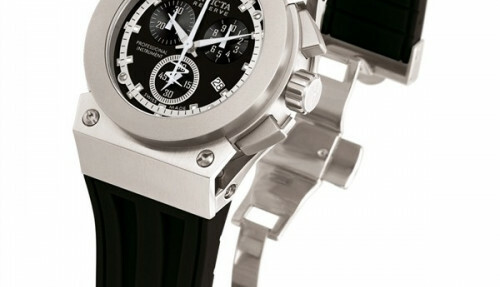 The Invicta Akula Sport Chronograph Quartz: A back view of the delicate clasp. 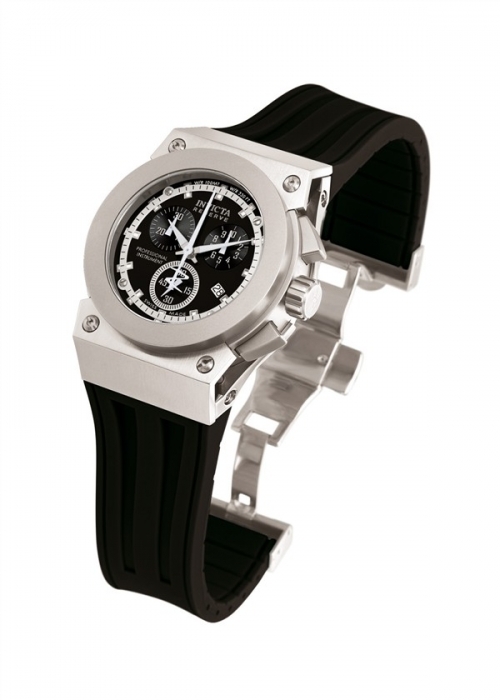 This watch doesn’t transition into business or formal attire particularly well and doesn’t mean to; it is, after all, a sports watch. Nonetheless, that is an unfortunate aspect of the piece. For a luxury item, this watch is aggressively utilitarian. The color scheme (black on brushed stainless steel) narrows it considerably, style-wise; it’s just too muscular. The case is a sturdy 40mm with a thickness of 13mm. The watch strap is 27mm wide, which can overwhelm a delicate wrist. 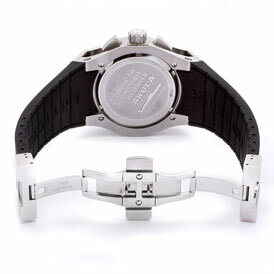 The watch clasp is somewhat delicate; the button that deploys it is easily brushed, causing the clasp to come undone. Since the band is a bracelet style that can be adjusted to a degree, the strap won’t open up—it will just loosen considerably. The Swiss Movement keeps precise time, and the watch is water resistant up to 330ft. This is a sporty, casual watch; perfect for active wear, but may be a bit too rugged for the office or anything on the formal side.